Prathu's Food: Paneer butter Masala - Passionate Cooking for Vegeterian Food. 2. Heat oil, fry few paneer cubes on medium heat until golden brown. Set the paneer pieces aside. 4. Heat oil or butter, fry onions, ginger garlic paste, for 3 minutes. 5. Add tomato paste and puree and simmer for 5 minutes. 6. Add cashews, Dhania powder, Cumin powder, garam masala powder, salt,chilli powder, extra butter and masala powder from step 1. 7. Add yogurt and stir until gravy becomes thick. 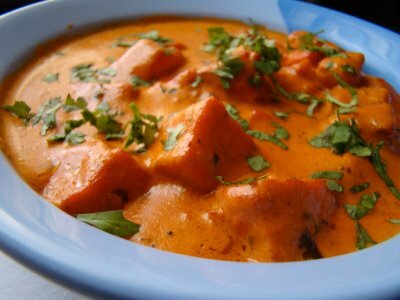 Add fried paneer cubes, grated paneer add 1/2 -1 cup water and simmer for 5 minutes , until all the flavour is absorbed into paneer. 8. Serve hot garnished with coriander leaves.